^ Spencer FA, Lessard D, Emery C, Reed G, Goldberg RJ. Venous thromboembolism in the outpatient setting. Arch. Intern. Med. 2007, 167 (14): 1471–5. PMC 2762787. PMID 17646600. doi:10.1001/archinte.167.14.1471. ^ Tsai A, Cushman M, Rosamond W, Heckbert S, Polak J, Folsom A. Cardiovascular risk factors and venous thromboembolism incidence: the longitudinal investigation of thromboembolism etiology. Arch Intern Med. 2002, 162 (10): 1182–9. PMID 12020191. doi:10.1001/archinte.162.10.1182. ^ Bagshaw M. Traveller's thrombosis: a review of deep vein thrombosis associated with travel. The Air Transport Medicine Committee, Aerospace Medical Association.. Aviation, space, and environmental medicine. 2001, 72 (9): 848–851. PMID 11565823. ^ 5.0 5.1 Philbrick JT, Shumate R, Siadaty MS, Becker DM. Air travel and venous thromboembolism: a systematic review. Journal of general internal medicine : official journal of the Society for Research and Education in Primary Care Internal Medicine. 2007, 22 (1): 107–14. PMC 1824715. PMID 17351849. doi:10.1007/s11606-006-0016-0. ^ Bendz B, Rostrup M, Sevre K, Andersen TO, Sandset PM. Association between acute hypobaric hypoxia and activation of coagulation in human beings. Lancet. 2000, 356 (9242): 1657–8. PMID 11089830. doi:10.1016/S0140-6736(00)03165-2. ^ Ferrari E, Chevallier T, Chapelier A, Baudouy M. Travel as a risk factor for venous thromboembolic disease: a case-control study. Chest. 1999, 115 (2): 440–4. PMID 10027445. doi:10.1378/chest.115.2.440. ^ Geerts WH, Bergqvist D, Pineo GF, Heit JA, Samama CM, Lassen MR, Colwell CW; American College of Chest Physicians. Prevention of venous thromboembolism: American College of Chest Physicians Evidence-Based Clinical Practice Guidelines (8th Edition). Chest. 2008, 133 (6 Suppl): 381S–453S. PMID 18574271. doi:10.1378/chest.08-0656. ^ Meyering C, Howard T. Hypercoagulability in athletes. Curr Sports Med Rep. 2004, 3 (2): 77–83. PMID 14980135. ^ Harvey T, Reynolds P. Athletics, Fitness. Airhealth.org. [February 3, 2010]. ^ World health organization. WHO Research Into Global Hazards of Travel (WRIGHT) Project : final report of phase I. 2007. ^ . Turpie AGG. 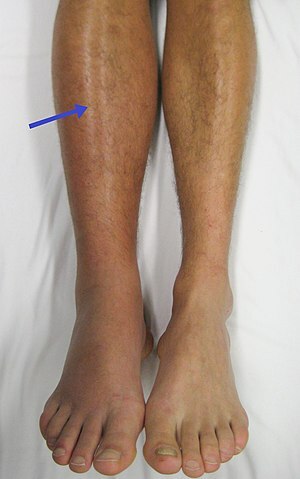 Deep Venous Thrombosis. The Merck's Manuals Online Medical Library. March 2008. ^ Scurr JH, Machin SJ, Bailey-King S, Mackie IJ, McDonald S, Smith PD. Frequency and prevention of symptomless deep-vein thrombosis in long-haul flights: a randomised trial. Lancet. May 2001, 357 (9267): 1485–9. PMID 11377600. doi:10.1016/S0140-6736(00)04645-6. （英文） Antithrombotic and Thrombolytic Therapy, 8th Ed: ACCP Guidelines. Chest (American College of Chest Physicians). June 2008, 133 (6 suppl b–C).